Having contemplated several landscapers, Harry and Lillian came to us when we were working on their neighbours' garden. Impressed with the work we had done, they asked us to work on their own. Both in retirement, Harry and Lillian wanted to transform their 250m2 garden into something that would be easier to maintain and more family friendly. 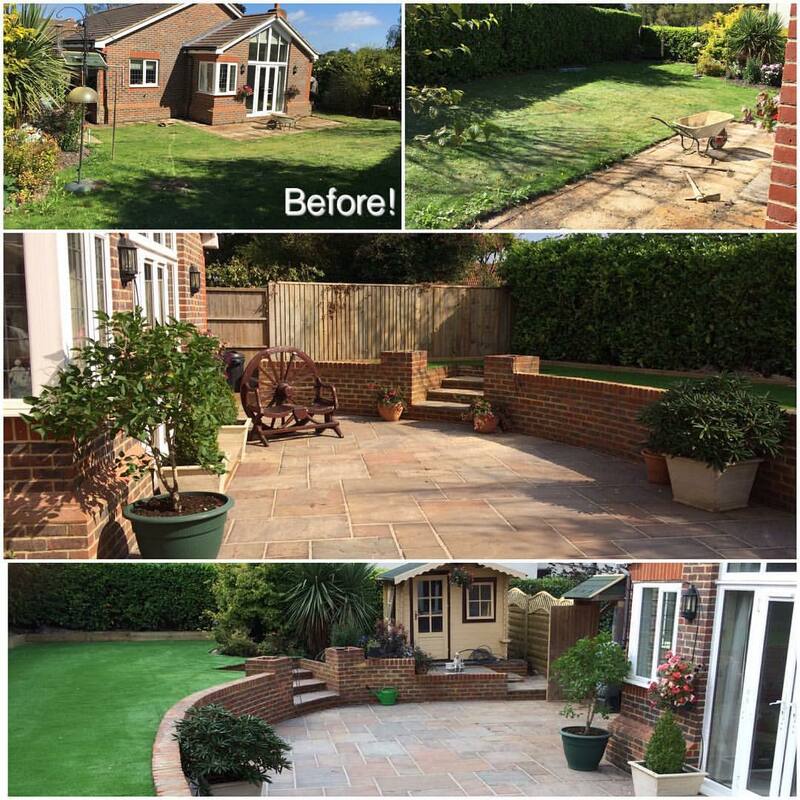 They asked us to level out the slopes, lay artificial grass to save on mowing, and create a larger patio area, perfect for family BBQs, as well as to remove one of their fences to claim back some extra land of theirs. Previously the patio was too small and the lawn had awkward slopes. Aye and his team of four landscaping assistants began work on their garden on 12th August, and with a just a few delays for bad weather which slowed down the brick work (we can always rely on British summer weather), finished towards the end of September. It always looks worse before it looks better! Measuring the grass. Cutting to shape was very tricky! Taking down and replacing a fence to gain access, the slopes were levelled, walls built and the artificial grass, which was supplied by Namgrass, being one of their approved and trusted installers, was laid. To the clients' brief, the bright 'green horizon' grass they picked out for it's vibrancy was laid with a striped effect, but though they didn't want to tell us initially, the clients let us know it wasn't to their taste. As it wasn't yet fixed down, and no extra materials were used, Aye kindly altered it to something more favourable for no extra charge. Sometimes, as a project progresses, clients realise that what they've initially asked for is often quite different to what they had pictured. As long as there is no extra cost for us, we're always happy to work with our clients and find an alternative – our clients' satisfaction is always our priority. Another last minute request we happily accommodated was to add lighting to the piers, for which we had used West Hoathly bricks, as well as adding pier caps. Harry and Lillian were fond of the Autumn brown sandstone paving from London Stone that we used for their neighbours' patio, so with the patio shape agreed and marked out, Aye and his team set about paving, avoiding the traditional sand and cement mixture, but instead using GftK: two part resin based, with the benefits of being frost proof and withstanding a jet wash, as well longevity. All of the stone we used can be found at the London Stone showroom. 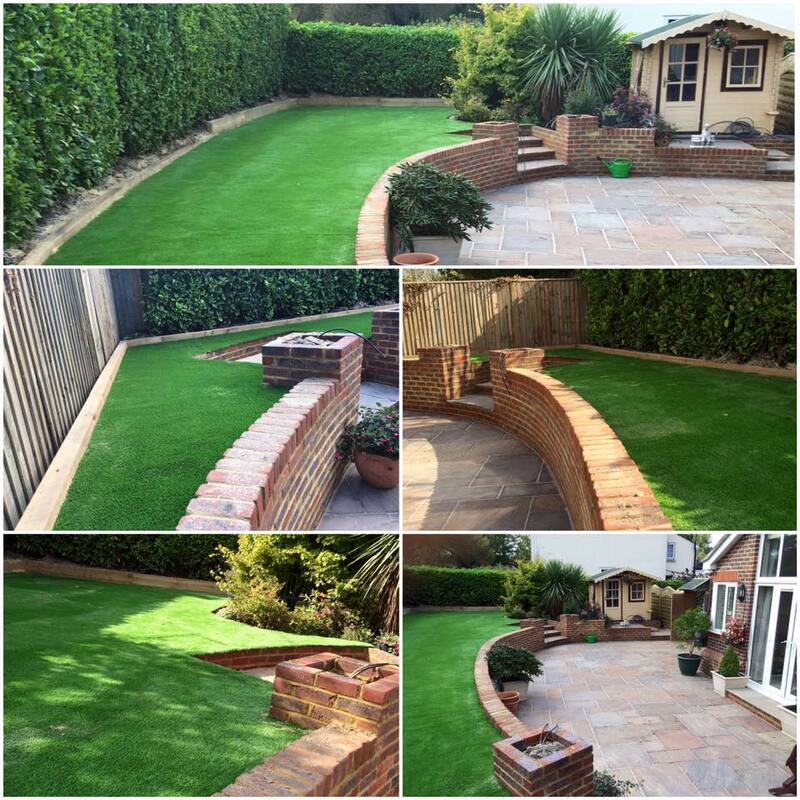 We're also able to send out up to four free samples of artificial grass to give you a better idea of what option might suit your garden best. Pier caps and lighting will be arriving in October. Having kept one large flowerbed and their summerhouse, Harry and Lillian's new garden was complete. They were so hospitable and accommodating throughout the project, ensuring our team were well looked after and always topped up on tea and biscuits. I also went along for a cup of tea at the end of the project to make sure they were happy with the result. In fact, we were all so proud of the result that our landscaper Ellantz even took some photos to send to his family back in Spain. The Autumn Brown sandstone has lovely warm brown tones. Ready for chairs and table. We do love a good transformation! We're now booked up until March 2017, but if you're looking to give your garden a new lease of life, please don't hesitate to get in touch, we'd be happy to get you booked in as soon as possible. You can find out more about our landscaping services here.